I thought it might be helpful to share some holiday gift ideas by sharing some of the great ones that I’ve received. Enamel bangles – my mom and aunt have given me some beautiful ones over the years and I wear them constantly. A fun pair of pajamas – growing up I always got a new pair on Christmas Eve, which were great to lounge around in over the holidays. The classic bag – there’s really nothing better than a quality black bag. B gave me a great one a couple years ago and it’s still my go-to everyday bag. The big girl jewelry box – this was at the top of my wishlist this year and thankfully B knew what a state of disaster my jewelry was in, so he gave it to me early. Such a life improvement – there are compartments for everything! Lux candle – in my opinion, you really can’t go wrong with Tocca. Rhinestone earrings – sparkly pieces are so perfect for this time of year. Who wouldn’t love having these for holiday parties? I hope that you get all your heart desires! These are some lovely gifts. 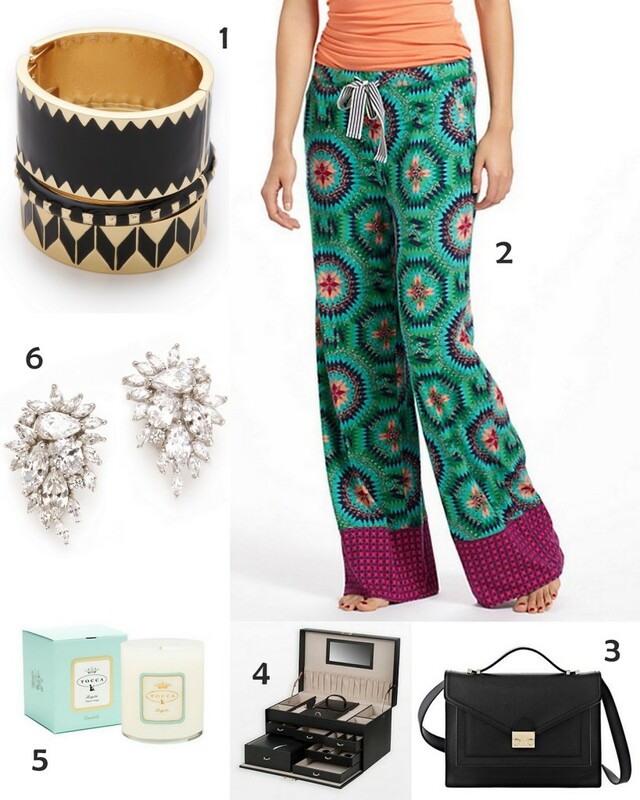 I'm especially loving the crazy printed pajamas and those stunning earrings! loving the jammies. such a fun print. OMG those PJ pants are so darn cute! Those bangles are stunning and so perfectly stackable! I would really want a classic or an everyday bag. Those pj pants are so fun! I think they're going on my wishlist! Those PJs are so fun. I definitely need to start investing in some great sleepwear! I looove those PJ pants, they are the cutest! Love love the rhine stone earrings. They're gorgeous! !